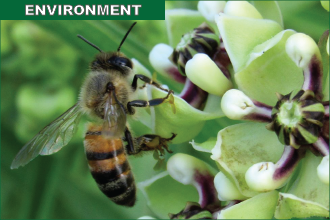 Pesticide application in a manner safe to the public and the environment as mandated by the Pesticide Applicator Act and the Pesticide Act and; Honeybee health as mandated by the Bee and Bee Products Act. The lesser known Bee and Bee Products Act mandates that the Department focuses on pests and diseases affecting commercial and managed honeybee hives. To help understand the parasites and pathogens that attack honeybees, CDA is taking part in the National Honey Bee Health Survey. The survey documents the presence or absence of bee diseases, parasites and pests of honey bees. The survey also samples pollen for the presence of over 174 pesticides. Colorado has taken part in the survey since 2011 and the data we are collecting is helping us to understand the major issues facing honeybee health. While still in the early phases, the results are shedding light on the fact that honeybee colonies in Colorado are fighting the same parasite and disease issues as the rest of the colonies in the United States. Management of these parasites is crucial to the sustainability of managed honeybees. Honeybee hives were sampled across the state in Alamosa, Arapahoe, Boulder, Delta, Denver, Dolores, Eagle, El Paso, Fremont, Garfield, Jefferson, Kit Carson, Larimer, Montrose, Mesa and Pueblo Counties. Varroa mite, considered to be honeybee enemy number one, was present in 80 percent of the hives sampled to date. Varroa mites are parasitic animals that feed on the hemolyph (blood) of bees. Not only do Varroa mites cause injury to a honeybee by itself, they are also responsible for vectoring several honeybee virus diseases. If left untreated, Varroa mites can kill a colony in two or three years. In fact, 95 percent of all the honeybee colonies sampled contained at least one of the four viruses vectored by Varroa mite. In addition to Varroa mites and viruses, a honeybee pathogen called Nosema ceranae was also present in Colorado. Nosema causes diarrhea in honeybees and was found in 43 percent of the hives sampled in the state. CDA also participated in the National Honey Bee Health Survey by collecting pollen for pesticide residue analysis. The most common types of pesticides found nationally and in Colorado are pesticides used by beekeepers to treat Varroa mites and Nosema disease. CDA is committed to participating in the National Honeybee Health Survey, to further our understanding and strengthen the data so that we can make meaningful decisions toward protecting the future of pollinators in the State.